The ongoing Consumers Electronic Show (CES) 2014 has seen a number of interesting launches from manufacturers around the globe. One of these includes the latest smartphone from Sony's stable. 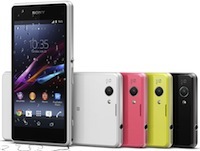 While HTC and Samsung already have mini versions of their flagship devices One and Galaxy S4, Sony has now unveiled a smaller version of its own flagship Xperia Z1. Christened Xperia Z1 Compact, the device sports a slightly smaller display- 4.3 inch in comparison to big brother Z1's 5 inch screen- and runs on the Android operating system. Here is a look at the specifications of the device. The smartphone features a 4.3 inch TFT capacitive touchscreen display (1280x720 pixels resolution) and runs on the Android 4.3 (Jelly Bean) operating system. It is powered by a 2.2 GHz Qualcomm MSM8974 quad-core processor with Adreno 330 GPU and has 2 GB RAM. The device offers 16GB of internal memory, which can be further expanded up to 64GB with a microSD card. Similar to the original Z1, this one also has a 20.7MP autofocus rear camera that comes with a pulsed LED flash and 8x digital zoom, and can record full HD videos (1080p) at 30 frames per second. In addition, there is a 2MP front facing camera for video calling that can also record full HD videos. On the connectivity front, the device has Bluetooth 4.0, Wi-Fi, 3G, & 4G LTE, and it also has a microUSB port & a microSD card slot. Z1 Compact measures 127mm x 64.9mm x 9.5mm and weighs 137 gm. Sony has added a 2,300 mAh battery in the device, which it claims will provide up to 10 hours of talk time, 12 hours of video playback time and up to 670 hours of standby time. The smartphone comes with Near Field Communication (NFC) and will be available in black, white, pink and lime colours. The device is both waterproof and dust resistant, and with it, you can take pictures while swimming in fresh water for up to 30 minutes (at least that is what the company claims). Just remember for doing the same, you will have to firmly close the covers for the micro USB port, the micro SIM slot and the memory card slot. Apart from the Samsung's and the Sony's of the world, homegrown handset and tablet manufacturer Micromax has also made its presence felt at CES 2014 by unveiling its first dual-boot tablet. 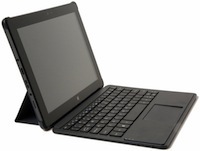 Christened LapTab, the device is powered by Intel, and runs both Android and Microsoft operating systems. While details on its pricing is not available as of now, LapTab will be officially launched in India early next month. The tablet sports a 10.1 inch IPS display (1280x800 pixel resolution) and is powered by a 1.46 GHz Intel Celeron N2805 processor. It also comes with brightness control technology, which automatically adjusts the screen content by continuously monitoring the environment. In terms of operating systems, this one supports both Android 4.2.2 Jelly Bean OS as well as Microsoft OS. To make use of the same, you can simply reboot the device and select the option to switch from Microsoft OS to Android and vice versa. It has 2GB of RAM and comes with 32GB of internal storage, which can be further expanded up to 64GB. The tablet also packs in a 2MP front camera for video calling. On the connectivity front, it has Bluetooth 4.0 and Wi-Fi, and the company has also provided a 7,400 mAh battery in the tablet. In addition, LapTab comes with a transleeve that can be combined as a cover and stand for the wireless keyboard, and is packed with a 230 mAh battery, which the company claims will provide over 20 hours of battery life (when combined with the internal battery of the device). Consumers will also have an option to buy a customised keyboard for the tablet post its launch. "Over the past few years, we have been witnessing a growing trend of increasing consumer demand for two operating systems in one device, which offers a blend of PC like productivity in a tablet like form factor," said Rahul Sharma, co-founder, Micromax. "Going forward, we would be unveiling an array of products across international markets in the next six months." In the second edition of our CES coverage, we will talk in detail about Samsung's four new tablet launches. Keep track of this space for more on that.